Do what you must so JDAMs don't blow your head off. 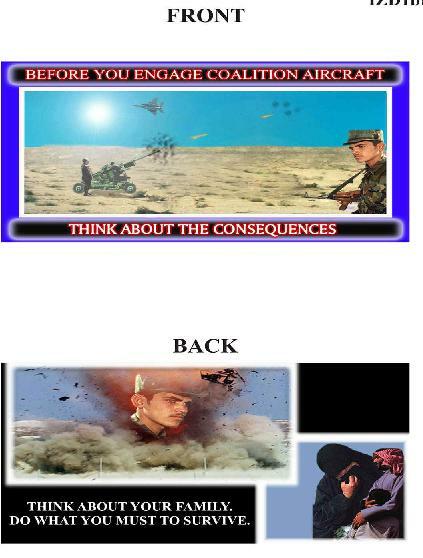 The image on the left is a leaflet dropped by Central Command air forces during Iraqi Freedom. Its message is blunt: Dear reader, you're going to get your head blown off. Originally, Uncle Sam was proud of its leafletting campaign. The news media spoke of how America's air-delivered postcards would convince Iraqis that our forces meant them no harm. And Iraqis would surely be safe if they just got out of the way and let the air force finish with old Saddam and his minions. This psychological operation was more successful on the US media. It bought the fantasy. It is put forward here as suitable art for a T-shirt. It was your tax dollars that paid for the thing, so you ought to get something for your money. Uncle Sam & the JDAMs -- real merch of our great war. CDs and T-shirts brought to you courtesy of Wolfowitz Records. Buy yours today!